War reporter Rageh Omaar is giving up his full-time BBC correspondent role to concentrate on other projects. Omaar, whose daily bulletins from the Iraqi capital Baghdad brought him international fame, will now work as a freelance journalist. 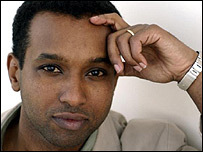 Omaar was formerly the BBC's Africa correspondent before taking on a wider news role during the Iraq war. A BBC spokesman said Omaar was "unequivocal" about wanting to continue working with the BBC. "Rageh is going freelance but he is unequivocal about wanting to work for the BBC and we are currently in discussions about his future projects," said a BBC spokesman. Omaar is also writing the first of two books about his experiences working in areas of conflict.